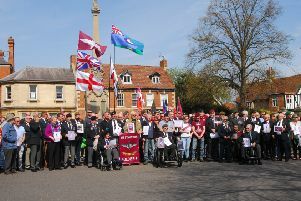 Staff at an opticians in Sleaford will be fundraising for blinded veterans throughout Armed Forces Week (June 22 to 28). Specsavers in Sleaford is helping celebrate 100 years of the Blind Veterans UK charity’s work helping blind ex-service men and women, by encouraging donations from customers. Blind Veterans UK was founded in 1915 and offers support, training and rehabilitation to blind and vision-impaired ex-service men and women. The charity’s mission is to ensure that all blind veterans have access to the finest quality services to help them with life beyond sight loss.